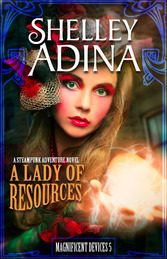 Today I want to tell you about one of my very favorite authors, Shelley Adina, who has just released the cover art for her next book in her Magnificent Devices series, A Lady of Resources! It's the fifth in the wonderfully popular series by Shelley and I just can't wait!! You can choose your friends, but you cannot choose your family ... or can you? Now sixteen, the twins Lizzie and Maggie are educated young ladies who have not been called “the Mopsies” in years … except by their guardian, Lady Claire Trevelyan. With the happy prospect of choosing their own future, the girls can leave their dodgy past behind, and Lizzie can bury her deepest childhood memories where they can do no harm. Upon her graduation from school, Lizzie is awarded an enormous honor—but can she pay the price? Is she ready to be separated from Maggie and become the woman she believes she was meant to be—or will old habits tempt her into defiance and plunge her into disaster? Here's a bit about the previous books in the series, if you haven't read the series yet... WHAT are you waiting for?? Here's the link to her page with lots more info! The Magnificent Devices SeriesLondon, 1889.Victoria is Queen. Charles Darwin's son is Prime Minister.And steam is the power that rules the world.